Acoustic sound baffles suspend vertically in rows and columns spread out across the expanse of your ceiling. These acoustic baffles can help stop echoes, minimize noise pollution, and reduce reverberation. The typical treatment is to tuck sound baffles inside the cavity spaces between exposed joists in an open deck ceiling. If your ceiling is flat, space the panels evenly between the joists. Set panels side-by-side like dominoes, average 3-4′ off center from one another. If your ceiling is vaulted, with a center peak, then place the sound baffles parallel to the spline of the ceiling. This will maximize their ability to capture and convert the echoes out of the room. The VET Baffles are the most popular of all our sound baffles. They are the least costly and the strongest absorbing. These acoustic sound baffles are class A fire rated, are waterproof, and easy to self install. They are available in 25 colors. These decorative acoustic sound baffles can absorb up to 80% of the unwanted echoes in your space. However, the key in creating a successful soundproofing treatment is to ensure correct coverage. You will need to order the correct amount of acoustical baffles based on the size, shape and surface textures of your room. Other acoustic baffles in our system work great to control noise, but will represent different price points or cosmetic presentations to your space. In any case, acoustic sound baffles offer an ideal way to capture and convert the unwelcome echoes in your space to produce the premium sound values you are seeking. If you need help with product selection or running baffle counts for your upcoming soundproofing project, please contact our help desk. Need help finding the right product for your space? Call our help desk at 1-800-638-9355. Our most popular acoustic sound baffle is the VET Baffle. They are easy to install and one of the most affordable ways to control excessive reverberations in your space creating optimal sound quality. From gymnasiums to industrial plants, these decorative and affordable acoustic sound baffles suspend vertically from your ceiling and will capture and convert the unwelcome echoes from our space. VET Baffles will lower your background noise, and generate a more user friendly and functional environment. 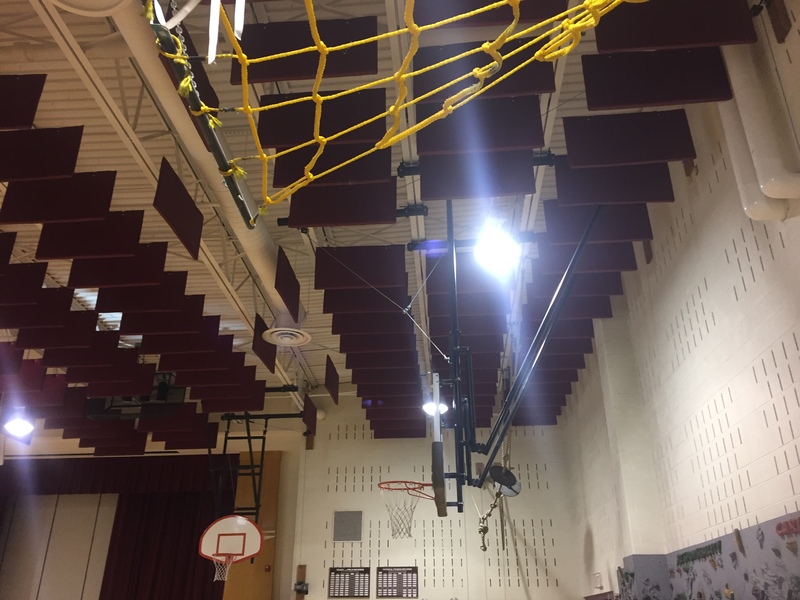 Fabric Sound Baffles are a colorful acoustical baffle option that hang from the ceiling in gymnasiums and auditoriums. They come in a variety of colors that are cloth wrapped on both sides to reduce background noise. The sound performance value of these decorative sound baffles match to the same values of our popular VET Baffles, but offer the upgrade of having the baffles wrapped in upholstered cloth. Ideal for higher end office, auditorium, theater, atrium and lobby soundproofing applications. These acoustic sound baffles offer an ideal compliment to their sister Fabric Panels that can flush mounted to perimeter walls. FireFlex Baffles reduce noise by capturing and converting unwanted echoes resulting in high quality sound. These acoustic sound baffles anchor mechanically to your ceiling and are evenly distributed for optimal echo reduction. 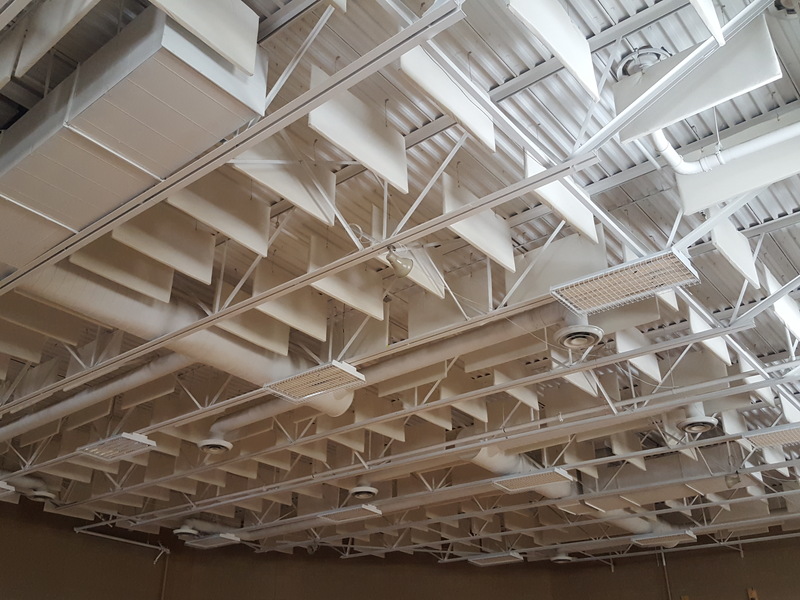 Most of the soundproofing treatments that opt for these acoustical baffles are industrial clients targeting lower exposure levels to factory noise. The goal to reducing your exposure levels to noise lies in getting your baffle coverage accurate based on the size of your space. Use this form to submit room dimensions and we will quote your project back.